You are correct, I should have written 500MB free. I've already turned off Windows Defender and I've set the network to Metered Connection. I still can't get the Compute Stick to run on a 12V (car cigarette lighter) to 5V power recharging unit. I even tried a USB-C 3A output with a good quality 3A rated power/recharging cord. So, I either have a defective recharging unit (I just bought it this week, but I may be able to test it with another device) or my configuration is drawing a lot more power. Also, I have one of the so-called smart, fast-charge units and I guess those "smarts" may be causing problems (I think the power is cycling constantly when it tries to start up, you can hear the filter changer start to move very slowly and then it stops, then a few seconds later is starts to move slowly and then stops again, and that cycle sometimes continues without end). However, when I use the Compute Stick's own A/C power adapter the startup is quick and very dependable. regulation might be very poor, e.g., no or very small output filtering capacitor is used. Any form of PC needs to have a stable power supply (especially the 5V based power input) to handle the PC's variable power demand. Without that, it had occasional freeze-up. James did you update the BIOS of the device? Also did you complete that large consolidated windows update I mentioned earlier in the thread taking around 3 hours? I am using a very basic 12V Cigarette adapter which has a dual port USB plug 2.1A/5V (Not even the 3A rated) and things seem to work fine. I even power the mini router off the second port of that little unit. I've had the unit plugged in powered on for 3 days straight off battery and it was still going strong. Also it seems not even an external USB hub is necessary to power the ZWO asi120mm and the polemaster at the same time. Network, I'm not sure but I am using 2.4Ghz and it's been great. I've had it on the home network as well as remote so far 2 remote setups and 2 local backyard setups and it worked very well. Just my IP address changed on the remote one but luckily I found it by accessing the router and seeing which DHCP address it used. It's stabilized between 2 addresses now so I'm confident. Ok so here are some pics, do with them as you will. I did not try planetary yet this is just running indoors at the moment but it very much reflects the exact results I was getting out in the field. Using about 50% of the memory with: SGP, PHD2, Eqascom, and for kicks I put carte du ciel in the back which I don't use often. This is with the settings above. Edited by entilza, 21 May 2016 - 10:54 PM. I've already done the firmware updates and checked for anything else from Intel (using Intel's own update utility, which in my opinion is a complete piece of garbage, it tried to update the same drivers again and again even though when the actual installer ran it said that the correct version was already installed). However, I don't think there were any updates for Windows other than some security and minor additional items but I may need to check on that. It's possible that my Compute Stick was manufactured more recently than yours. As for the power, I think it has something to do with the smart charging technology, but the reason I purchased that particular model is that it had the highest power rating of anything else I saw (25W x 5V, with three ports, two standard USB2 at up to 2.1W, and one USB-C at up to 3W). I may try to use a "dumb" charger that runs at 2.1W to see what it does. I would think only the Atom Processor Version. YOu would need to purchase a 64bit windows license though. This gadget (BOXSTK1AW32SC) is using CherryTrail X5-Z8300 2G/32G w/ included W10Home 32bit license. Similar Kangaroo PC: also using CherryTrail but slightly better X5-Z8500 2G/32G w/ included W10Home 64bit license. You definitely want the intel over the kangaroo. The main advantage is that the compute stick has a fan so it won't over heat. Also Windows 10 is the best option for these guys and frankly a step up from Windows 7 in performance terms on low memory devices anyways. My Lenovo stick came with a regular Windows 10 Home Edition license 32 bit. It has a Intel Atom Z3735F Processor Quad core 64bit 1.33 GHz Processor 2 GB SO-DIMM DDR3, 32 GB Solid State Drive. I easily worked around the C: drive size limitation by installing a reasonably fast 64GB microSD, which becomes the D: drive. I then installed and run all my applications on the D: drive. The big users of disk space are the astrometric index's for plate solving and my captured images. I have never paid attention to the CPU or memory utilization, as I haven't really had any problems along those lines. 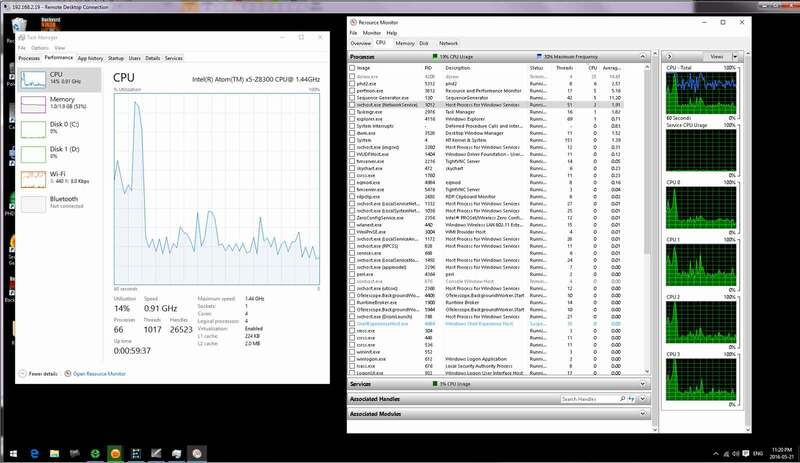 I will try and remember to bring uo task manager or performance monitor next time I image. I doubt you would get Windows 7 installed on one of these sticks. You can find some out there with Windows 8.1. Personally I don't see Windows 10 as being an issue on these little guy's. Edited by Pauls72, 22 May 2016 - 04:26 PM. The Lenovo is pretty much a clone of the early Intel. I'm using Windows remote desktop to access it and Windows Defender is turned on. When it would save an image processor would go up to around 50%. When plating solving the processor would go up to 89%. 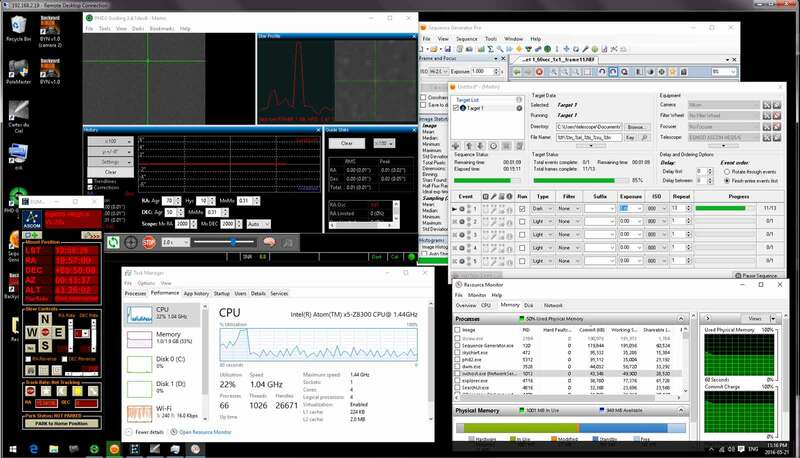 The processor would ramp up to 2.33GHZ while solving. I was taking 10 minute images with Nebulosity and PHD2 was taking 1 second images. I spent some time this morning with my second generation intel stick computer. It will boot nicely with the power supply that comes with it. It will boot nicely using a cigarette lighter adapter and a short USB to USB micro cable. I tried 3 different extender cables and it would not boot with them. So, I conclude that I need a longer cable and that it's very sensitive to having enough power. One extender appeared to work - the blue light stayed on- but the stick never booted to windows. The other two lit the stick up momentarily and then the light went off. So, it may be that it you have trouble with cigarette light adapters it might be your cabling that's at fault. The 12 v power supply is a 5 amp Pyramid unit. I also did some testing last week running it without the HDMI converted stuff and found that if you use remote desktop (you need to install RD wrapper) on it you don't need to bother with the HDMI connectors. I also think that RDP is going to be lightweight in terms of memory as compared to Teamviewer (I haven't tested it.) Finally, RDP lets you have two screens attached to the stick. I've tried it out and it works fine that way. I've also found that the WiFi is pretty weak on my Compute Stick (at least at 5GHz, which is what I have to use since my USB3 hub/camera completely kills the 2.4GHz band). However, the 5GHz performance is so bad that it struggles to connect when the WiFi basestation is only about 15' away with just a very thin wall between it and the Compute Stick. Meanwhile, my iPad can connect to that same 5GHz connection when I'm outside in my car with the car doors closed and with the iPad sitting on the floor of the passenger compartment (meaning that there is a lot of metal between it and the basestation). It looks like the 5GHz WiFi is only good at short distances, line-of-sight, with no walls between the basestation and the Compute Stick. I also had a fairly lengthy session two nights ago using the Compute Stick while I was actively imaging outdoors. The first problem was the WiFi, as I had to move the basestation so that it was visible through a window and only about 12' from the Compute Stick. Even then I had to put the Compute Stick on top of a tripod that I extended as high as possible and placed as close to the window as the cables would allow and after all of that I finally got a decent connection. That wasted probably an hour and I finally got things running but unfortunately that wasn't the end to my problems. During about 3 hours of use I had two crashes in Sequence Generator Pro and then TeamViewer started acting up on my iPad so that mouse clicks didn't register correctly. The latter (mouse clicks) could be fixed with a disconnect and then reconnect of TeamViewer, which generally took only a minute or two. However, each time SGP crashed I had to re-launch the app, re-open the sequence, reconnect to the hardware, and then wait while the temperature regulation on the camera stabilized and that generally took at least 5 to 10 minutes. Meanwhile I was also fighting with low clouds which came and went and thus I got only about one hour of total integration time during the 4 hours of trying. Now, the really odd thing is that I had done indoor testing of TeamViewer with SGP on the Compute Stick for probably a total of twenty hours before this session (over four days and nights) and I hadn't had a single problem other than when I tried to use the 2.4GHz band for WiFi or tried to use a 5V cigarette-lighter-type charging plug with the Compute Stick. So, either my luck changed or the problems were somehow related to having everything running outdoors. The only totally new configuration I made when I moved outdoors was to supply power to the camera's temperature regulation, since a lot of my previous testing included both mount operation, camera operation (without cooling), and guiding on an artificial star. I guess my conclusion is that I'm close to giving up on the Compute Stick, at least when trying to use it remotely over WiFi. Too many hassles and unexplained failures and I really think the hardware performance is on the very edge of acceptability. Maybe in another year or two if they offer more memory (4GB) and a faster Atom processor and (hopefully) better WiFi at a price similar to the current generation (I think the Core M3 and M5 versions are WAY too expensive for what they offer, since they cost as much or more than a similarly equipped notebook computer). I'm going to try one or two more things and that may be the end of my attempts. I was planning on using a different WiFi basestation for when I was out in the field (mobile imaging) and thus I'm going to see if that will work at home with the basestation actually outdoors near to the scope. Next, I'm going to double check everything on my Windows installation to see if I can get the memory usage down by another several hundred MBs. I may also try another remote access utility other than TeamViewer, but that will have to work with both my Mac and the iPad. TeamViewer has a lot of nice features and it seems pretty stable on the desktop, but it does seem to be a little resource intensive when running on the Compute Stick and the mouse interaction failures I had on my iPad were a bit of a disappointment. Yeah it's got to work reliably. Can you try another Channel for the 5Ghz? I would seriously try RDP and just be done with it, it will be compatible with the mac. The latest versions of TeamViewer allows you to force a connection over your LAN. You can set this in the Extras/Options/General Panel. That may help a bit. Remember to get the correct IP address for the stick or you will waste time guessing it . After a bit of testing I think that it works faster that way. That's how I use it in my observatory - there's no internet available so I just connect using a router I've set up. I've decided that I'm going to try to use RDP and see if I can cut the default resources on Windows to the "bone" to get a bit more performance and to save some memory. The Atom-based 2016 Compute Stick seems pretty close to being the right solution but I do wish it had 4GB of memory and a little faster processor. I don't know about the WiFi, but I'm thinking if I place a range extender outside or even move the basestation out to the scope that it may be okay. I've noticed that when Firecapture is saving images to disk that the CPU usage is pretty much maxed at 100% (constantly), so that may prove to be a bit of an issue. The capture framerate seems to be pretty good as I've seen 5fps even when saving 6M pixel, 16-bit images from my ASI178MM. Of course when doing planetary work with a small ROI it can run as fast as allowed by the USB3 connection (several hundred frames per second, limited by the camera and the exposure time). What is the use case for 5fps full frame? The netbook I have has similar specs but it seems to perform better. There must be something more to the specs. It is a shame about the wifi, but the netbook probably has an antenna in the lid which is why it has a long range. You could try a USB wifi adapter that would at least have a bigger antenna. I use full frame to photograph the moon and I also suspect that I'll be doing some 1fps lucky imaging on DSOs. At 16 bits that 5fps is about 60MB/s write speed to the microSD card which I think is about the best you can expect with a UHS-I interface. I just ordered a small 802.11AC range extender for less than $40 from Amazon. I suspect that will solve my problems when I'm trying to connect through my router that sits inside my house. When I was testing indoors I had pretty good luck with the 5GHz connection and since I have only one outside wall between my scope and the router I think the range extender will solve the problem (I'll just put the range extender on a post about half way between the house and the scope and since I run extension cords for the A/C power while I'm at home it's easy to get power to everything). I'm going to try RDP. As for the drivers, I updated everything a few days ago using Intel's update utility. Apparently there was a bug in the earlier firmware that affected the update utility (never showed any updates, I think), so I upgraded the firmware and then ran the update utility and it found several updates for the Compute Stick. However, now the update utility keeps saying that I need to update every time I run it, even though the updates have already been installed (confirmed by the actual installers when they try to run). So, I think the "fix" they did to show updates is also broken as it keeps saying that updates need to be made. To restart a remote desktop, it's not that simple. If you click the power icon you only get "disconnect"
ALT-F4 works ok but on my phone there are too many clicks to get to that feature. I created a folder called 'restart' which has 2 icons, restart and power down. I put them in a folder to avoid accidently clicking on them. You can create 2 command line icons with the following parameters to create these. Thanks for that, I had just done a search on the internet to learn about the ALT-F4 method which works fine on my installation of RDP. However, the command line "trick" looks useful. Also, it seems that after switching from TeamViewer to RDP my memory use went down significantly, so now I'm seeing about 1GB free after launching (but not actively running) SGP and PhD. I'll have to see whether that holds when I'm actively imaging and guiding. You might want to try your 2.4Ghz wifi now that you are on RDP it may have a much reduced bandwidth load as well. It should be the same no matter what you are running, other than the app's own memory requirements. The rendering is actually being performed on your local client. There is no "screen" on the remote machine. Programs like TeamViewer and VNC capture the screen on the remote machine and send that to your local client, using compression and such to speed up the process. But RDP is sending semantic information to your local client and it is rendering it. Usually, running a remote machine through RDP is even less processing intensive than running it locally with a monitor attached. But network bandwidth will take a hit if the remote machine is doing things like playing a video. I could, but it won't help since with USB3 the 2.4GHz band is basically dead. Also, RDP didn't seem to reduce the bandwidth that much and I can still see peaks in CPU usage up to 40% just by moving the windows around on the host. As for the memory and switching between TeamViewer and RDP, to be honest it didn't make much sense that the memory requirements would go down by several hundred MB, but that's what seemed to happen. Besides, TeamViewer HAS to use memory on the host, it's just that I'd think that it would be only a dozen or so megabytes not a few hundred. But, who really knows what evil lurks in the minds of utilities and apps. 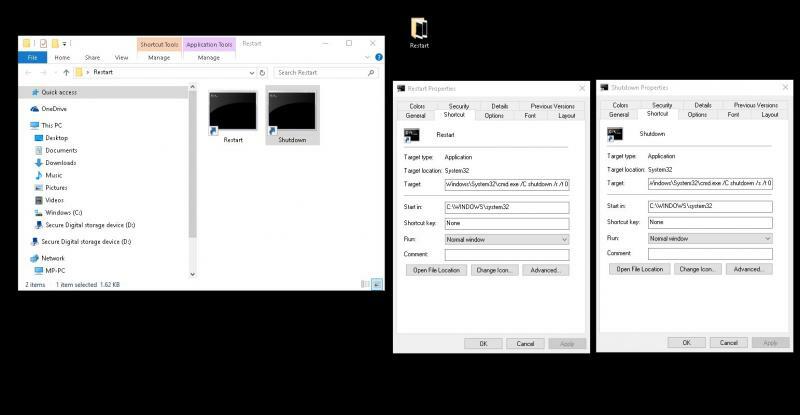 In any case, there is a "screen" on the host when you are using TeamViewer, since you need to have an HDMI dummy connected to make the video work. However, RDP apparently doesn't have that restriction (it seems to work fine without the HDMI dummy plug). Edited by james7ca, 25 May 2016 - 09:24 PM. I am just using USB2 right now, though I am using the port, So maybe a tinfoil hat around your cables Good to know of anyone trying this setup though and perhaps go for a 5Ghz WIFI solution. I used to change my Wifi Channels long ago when I used to have these types of issues, have you tried that for the 5Ghz? I realize the iPad works well, just a suggestion. For out in the field I have a separate router all together. What's in that SoC, which is the largest chip, the main chip inside? - GPU (graphics processor), <-- you heard of ATI and NVIDIA, right? 512MB, sometimes, 1GB or 2GB DDR4 or DDR5 memory. Then probably you also remember there was an era such graphics card does not have its own memory but use "Shared Memory" approach. Now going back to the recent trend, for Intel SoC (and AMD SoC), not just limited to ATOM family, but also Gen 2/3/4/5/6 CPU (actually should be called SoCs <-- AMD calls it APU, application processor unit), they also take the shared memory approach. There is no dedicated memory just for the GPU. It's back to the shared memory approach. 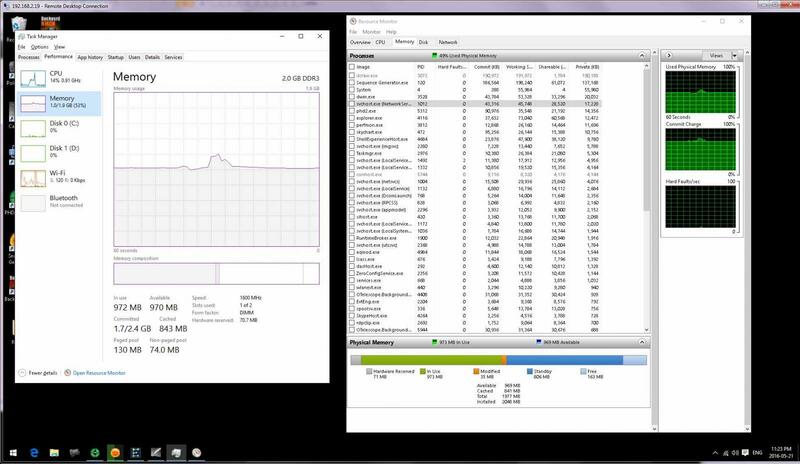 Consumes about 3.1W and there is 111MB listed (in Task Manager, Detailed Memory) as "Hardware Dedicated Memory"
Remember RDP is using the PC nearest to you (called the RDP client) to do major lifting. The mount-side stick PC is not using its GPU function at all !!! (assuming you did not plug a monitor in...) What it is doing is just to send the high-level graphics commands to the RDP client which need to do the real work. Edited by ccs_hello, 25 May 2016 - 10:33 PM. True, the GPU on the Compute Stick is using shared, main memory for its graphics operations and I guess by default that could be a notable amount of memory. Actually, I've done some more tests and it looks like TeamViewer may not use any more memory than Microsoft's RDP (at least under relatively static operation). However, it looks like the worse case CPU load on the host is higher with TeamViewer. In any case, I'm pretty sure that the client PC can only do the "major lifting" when the graphics are being rendered using commands that can be fully interpreted on the client hardware and OS. Thus, if a bitmap or pixmap is being directly manipulated on the host then the host may have no option other than to render the image and then send the compressed bitmap/pixmap to the client. You can see this yourself when you drag a window around on the host and the host CPU usage shoots up dramatically. When running the RDP client on Mac OS X I see a jump from only a few percent CPU usage (on the host) to almost 40% usage when dragging a window and you can get very similar spikes when you display image capture data in SGP or Firecapture. Thus, under both your and syscore's explanation what causes this spike in CPU usage on the host? I say it is because the host has to render and then compress the bitmap/pixmap and then send that over the network connection and I'd call that a "major lifting." This is one reason why RDP offers a bitmap cache to try and reduce the amount of data that is sent between the host and the client. However, sometimes this bitmap cache can cause rendering problems so if your network and host CPU can handle the load then it may be better to turn the cache off. Frankly, I don't know whether the Mac OS and iOS clients support bitmap caching, but that is something I should look into. As for the WiFi interference that is caused by USB3, that can also affect the 5GHz band but generally it is much less of a problem in that band than it is for 2.4GHz. Also, several days ago I tried to shield the UBS3 hub using a few layers of aluminum foil and that did help, so the "tinfoil hat" does indeed work to some extent, but the 5GHz workaround is potentially an easier and "better" solution (IMO). In any case, I should have my 802.11AC range extender this Friday, so by this weekend I may know whether that solves my problems when I try to access the Compute Stick from the WiFi router that is inside my house. Edited by james7ca, 26 May 2016 - 03:42 AM.